Is the continuity of power supply important to you? The Mobeye PowerGuard power failure alarm reports power outages and power restoration via telephone call and SMS message. 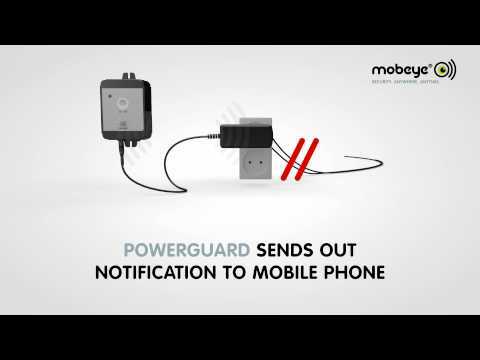 The Mobeye PowerGuard also has two additional inputs that can be used to monitor additional equipment if required. By connecting devices or external sensors the Mobeye Powerguard can monitor much more, like the operation of automatic machinery or sensors. The power supply monitor is ready for use and easy to install. Alarm signals are sent via the internal GSM module. Install a SIM card using any mobile network (Avoid the '3' network) and it will call up to 5 programmed telephone numbers and send text messages. By only plugging the power failure alarm into an AC outlet, the power supply is monitored. Alternatively the power supply monitor can wired in to a 12VDC power supply. Sensors or devices can be connected to the NO/NC inputs. After an activation the power failure alarm sends an SMS alert followed by a phone call to up to five phone numbers. Several settings can be programmed easily, like alarm delays on the power failure, alarm delays for the inputs, user defined alarm texts etc.